For anyone with sight, calipers are essential tools for school and everyday life. Students put them to great use for geometry, mathematics and other science and technology subjects. Calipers can be used in many day-to-day activities. Craftsmen, artisans and professionals use them for high-quality workmanship. There has never been a refreshable braille caliper so that people with a vision impairment could obtain the same precision and ease. Now, there is! No more having to estimate based on the width of a hand; measuring one flower pot by lining it up with another one; hoping that the piece of wood you’ve just sawn is even with the last one, or that your knitting needles are the size you think they are. 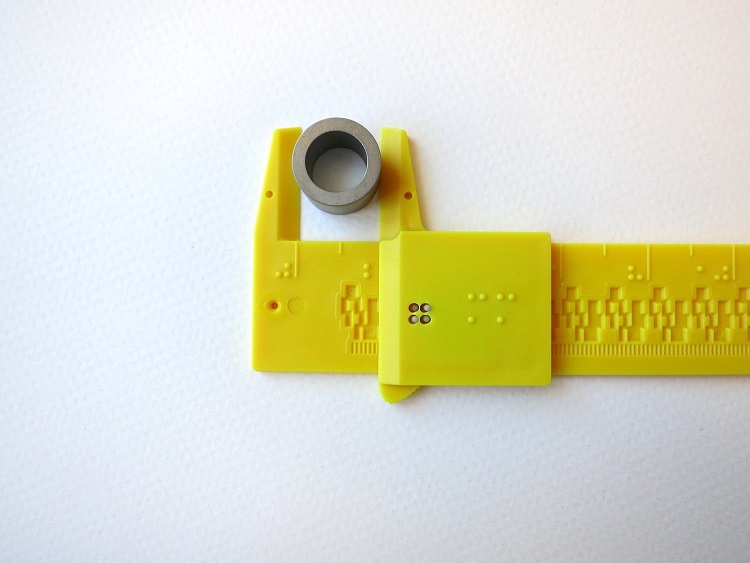 This braille caliper is uniquely-designed, essential for independent living, and perfect for professional projects. Bring 1mm (1/16-inch) of precision to crafts, carpentry and design work. What IS a Caliper Anyway and What is It Used For? The Tactile Caliper is an instrument to measure and draw straight lines with high precision and speed. The 12-inch or 30 cm caliper allows measurements as minuscule as 1 mm or 1/16 of an inch, up to 30 cm or 12 inches. The entire reading is displayed directly in Braille. It can measure up to 300 mm (12 inches). The slider includes a braille counter which updates with each millimetre (16th of an inch), as you move the slider to measure. They also clearly indicate the distance for accurate measurement and drawing. Be creative with any drawing instrument you have! Silicone pads prevent slipping on plastic, paper and wood. 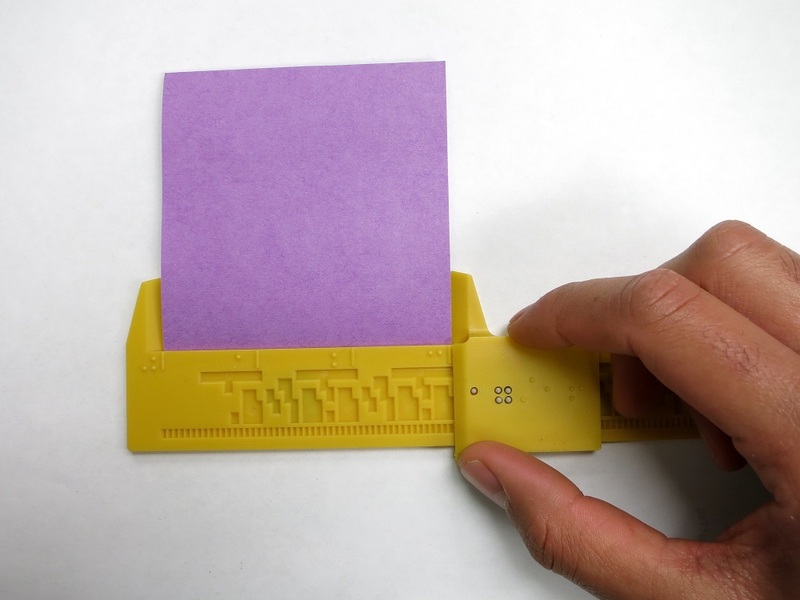 Why leave that to chance, when every other detail of your measuring is so precise? Pin Holes at both ends of the caliper enable afixing the device to a cork or rubber drawing board. This is especially useful when training young users. Pin holes on the movable jaws permit locking a location into position, when recording various data during an involved project or homework assignment. Each caliper comes in a durable plastic carry pouch. This ensures safe storage of the caliper when carrying it in backpacks, geometry kits and other tools. Our tactile calipers can be purchased in Either metric or Imperial measurement. They come with both English and French instructions. Purchase the metric caliper on the Metric Braille Caliper product page. Purchase the caliper in inches on the Braille Caliper in Inches product page. and don’t forget to leave us a review for a chance to win Tactile Vision Graphics merchandise. We’ll draw a name every month from all the reviews on the calipers pages for a $25 gift certificate. .
You are here: Tactile Vision Graphics Back to top ↑ > Blog > Blog > Finally! A Caliper You Can Read in Braille!